Before my trip to Latvia, Lithuania, and Estonia, my impression of the Baltics was based on only two pieces of information: the countries used to be Soviet, and it’s probably cold there. And while I did need a sweater in the spring, my idea of what a former Soviet country would look like was blown out of the water. Basic, gray, concrete, utilitarian, ugly? Think again. 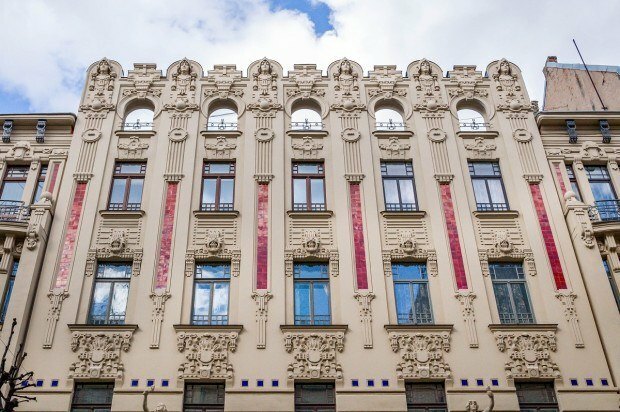 Art Nouveau in Riga couldn’t be further from my misconception of what this place would look like. Only one kilometer from the heart of Riga’s Old Town is the city’s Art Nouveau district. 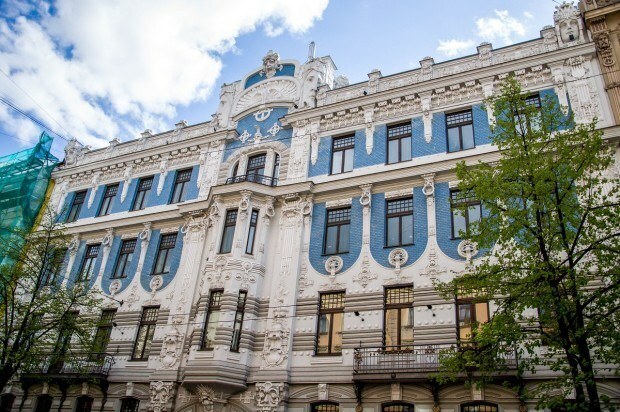 While Riga has over 800 Art Nouveau buildings in all, some of the best examples line Alberta, Elizabetes, and Strelniku streets. That’s where I focused on my visit. The short-lived Art Nouveau movement began in Riga just before the turn of the 20th century (1898, to be precise), long before the Soviets were in the picture. Until this time, art and architecture in Europe followed strict rules and norms. But a period of significant economic growth across the continent led to a new middle class. People had a better quality of life, money to spend, and a desire to demonstrate their new-found wealth and “lightness.” This new way of living meant it was time to break the old rules. Art Nouveau was different from any other style before it. It was about opulence, creativity, and shaking things up. Art Nouveau was a rejection of everything plain. It drew from aspects of nature and fantasy as well as shapes and curved lines. 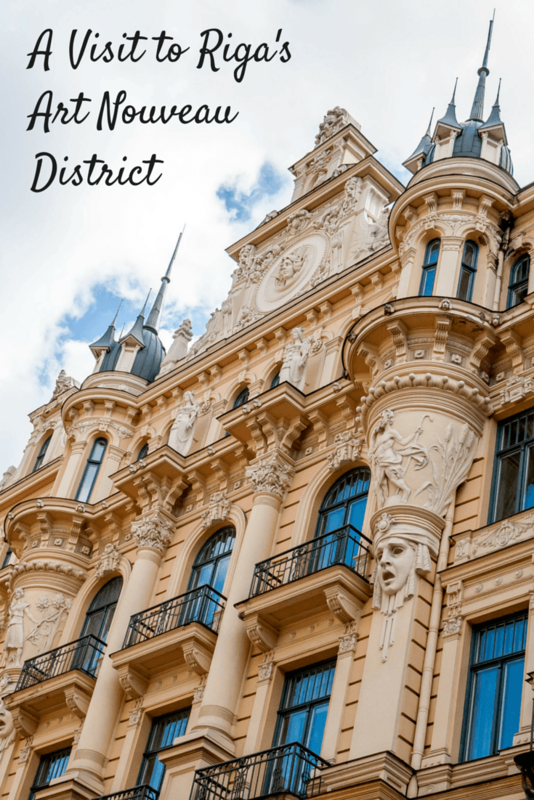 As you walk around the Art Nouveau district of Riga, all of these elements are still apparent as you gaze up at the faces, animals, and unusual things that adorn the facades. It reminded me very much of the architecture of Rockefeller Center in New York, seemingly a world away. It’s hard to imagine now, but these unique buildings were not well-received by critics when they were built. 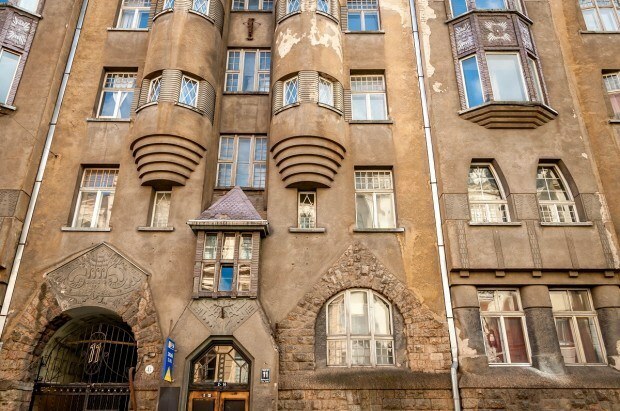 The work, especially that of high-profile architect Mikhail Eisenstein, was rejected as exaggerated and eccentric – an eyesore in the otherwise lovely city of Riga. Nevertheless, all the houses on “piteous Alberta Street,” as it was called, were bought. 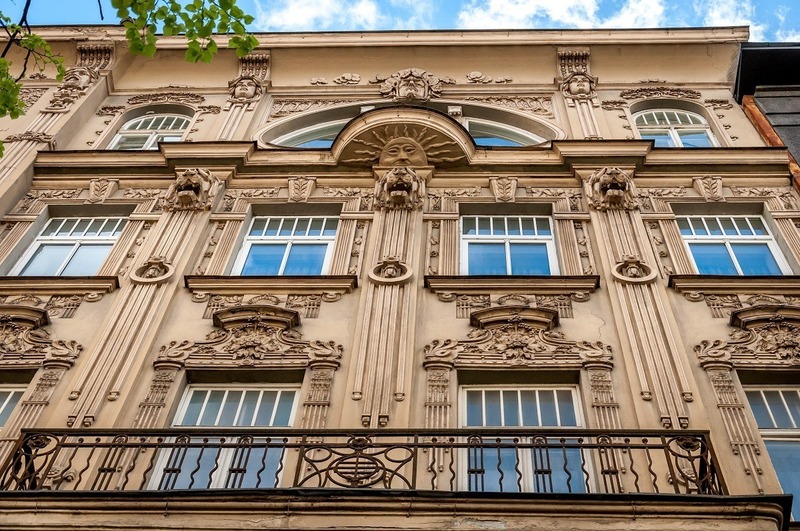 Around the time of World War I, money became more limited, and tastes began to shift again, so new Art Nouveau construction stopped only about 20 years after it started. During Soviet times, the buildings were claimed by the government. Used as communal houses with multiple families living in each apartment, the interiors gradually fell into disrepair. On the outside, layers of pollution and crumbling facades marred the beauty of these unique structures. When Communism fell, the new government had more important priorities than renovating the Art Nouveau buildings, and individual citizens lacked the funds help. The potential for tourism (which was almost non-existent) and fixing the buildings took a backseat to feeding people and stabilizing the economy. Over time, though, many of the buildings have been restored to the way they looked 100 years ago, and others are still undergoing repair. 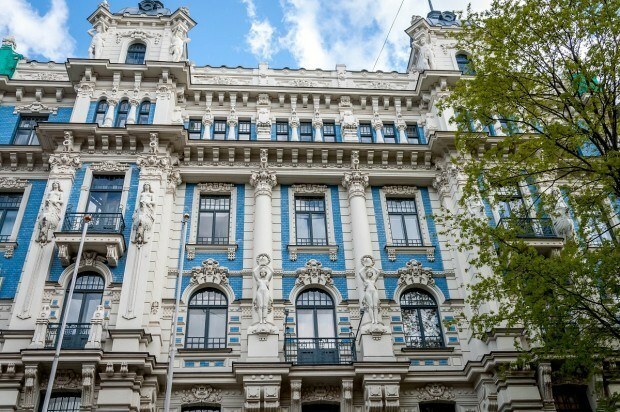 Today, the Art Nouveau buildings are one of the most distinguishing aspects of Riga. Their existence and volume was at the heart of the decision to make the historic center of Riga a UNESCO World Heritage Site. Proving Eisenstein’s critics wrong, Alberta Street is now one of the most expensive stretches of real estate in the Baltics. 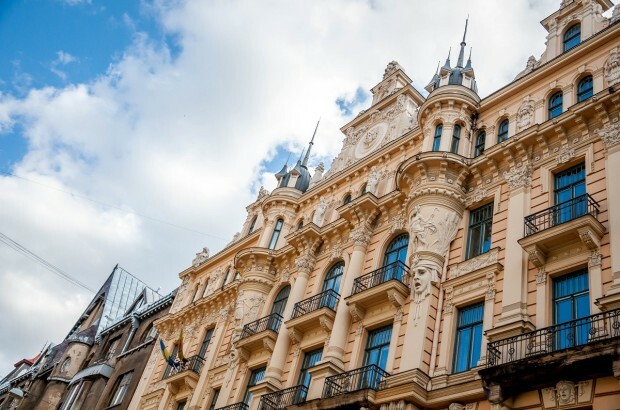 A visit to the Art Nouveau area of Riga is a surprising step back to a time of playful, unique art and architecture before the dark Soviet times. A walking tour of the area takes less than an hour, plus a little extra time if you choose to visit the Riga Art Nouveau Museum. 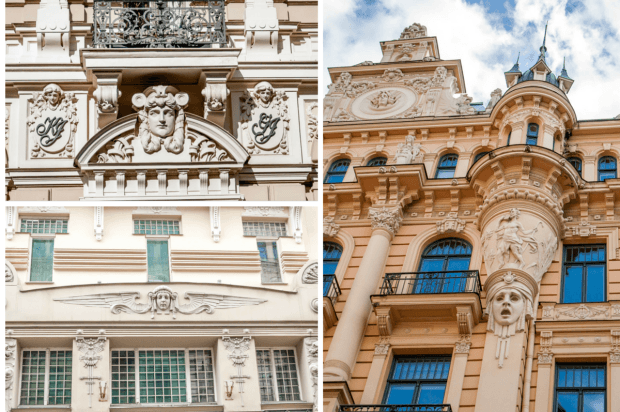 We explored the Baltics as guests of JayWay Travel and stayed at Hotel Justus in Riga. As always, opinions of the whimsical and creative are our own. What do you think about Riga’s Surprising Art Nouveau Heritage? I’m so glad we looked up to see that sun carved under the balcony! Such a fun little surprise! It was great. I have a feeling there are 100 other surprises to find if one has the time to look for them, considering how ornate some of the buildings are. 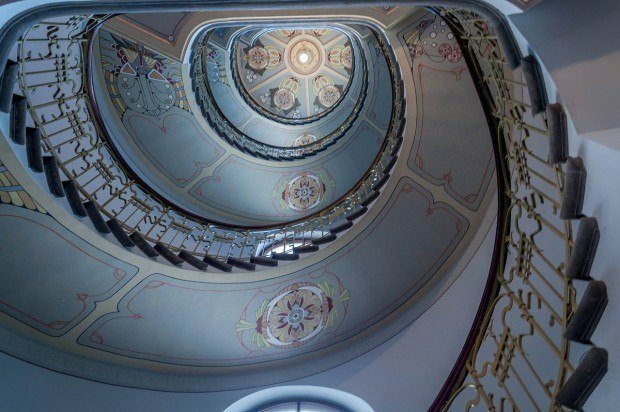 Love the photo of the staircase! Thanks, Tami. It’s a great neighborhood. Isn’t it interesting how many new things are greeted with disgust when they first arrive on the scene – and yet not too many years later, they’re celebrated far and wide. It’s the same with the Eiffel Tower, Sydney Opera House etc etc! Very interesting take, Abi. I hadn’t thought of it that way, but it’s very true. I absolutely loved Riga but didn’t have an opportunity to see the rest of the country, so it’s on the (very long) list to return to. It’s certainly not unusual for there to be big difference between a country’s capital and the rest of the area, though. Art nouveau is my new obsession!!! What gorgeous buildings. I’ve been thinking I need to get a passport stamp lately, perhaps Riga shall be my point-of-entry! Gorgeous gorgeous gorgeous! Definitely not my idea of what the Baltics would look like, either. You’ve piqued my interest in this region! I’m the Baltics’ newest ambassador 🙂 I loved my time there! I’ve been to Riga twice now, and it’s so unexpectedly clean and elegant. I’d love to go back again! So much to see and photograph. Totally agree. This was just the tip of the iceberg. Love your photos, Laura! They bring back gerat memories. I was in Riga a few months ago and visited the Art Nouveau district (absolutely loved it!). I couldn’t find the museum though, and no one seemed to know where it was. Was it on Albert Street? Yes, it’s on Albert with an entrance on Strelniku.